Welcome to The Brainy Business Podcast. My name is Melina Palmer. I am super excited to chat with you every week and give you insights into how the human brain works, how it makes buying decisions, and how you can use that in your business. The human brain is amazingly complex and interesting and, even though we all have one…we don’t really understand how they work. I consider the brain to be the final frontier – which is one reason a rocket is part of The Brainy Business logo. Justin with 52 Card Media did such an amazing job with The Brainy Business branding, logo, business cards, website and strategy collaboration. He was awesome to work with, and I would absolutely recommend him to anyone. We are constantly finding new research on the brain. In this podcast, I will translate dense research papers and journals into bite-sized pieces for busy professionals like you. 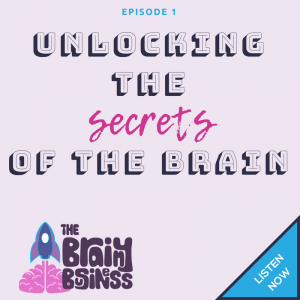 Today’s episode is about unlocking the secrets of the brain. This is really what behavioural economics is about and what I’m passionate about. Today, I discuss why you should care about behavioural economics and its impact on business, a foundation of how the brain works, and a little about me and my background and why I’m qualified to share this information with you. [01:14] The Golden Age of Neuroscience has Arrived and how we have learned more about the thinking brain in the last 10 – 15 years than in all previous history. [03:30] It’s fascinating to understand how our brains make decisions, and it’s not just for academics. [04:51] If you want to geek out on research with me send an email to melina@thebrainybusiness.com. [05:27] Unlocking the secrets of the brain and the 3 things I cover in this show. [06:53] Why you should care about behavioral economics and the impact it has on your business. [08:46] If traditional economics and psychology had a baby, you would get behavioral economics. [09:50] Behavioral economics is a field that is on the rise. [10:46] People frequently make irrational decisions. Psychologists and economists started working together to explain and predict behavior. [13:44] Behavioral economics has been able to predict decision-making processes. [14:16] Understanding this process will help you turn people who are interested in your business into paying customers. [14:41] How the brain actually works. A foundation. [15:40] The cognizant part of your brain or thinking about thinking. [16:53] Amazing insights from Daniel Kahneman and his book Thinking, Fast and Slow. [18:03] Simplifying things by using the term conscious and subconscious. [18:45] 99% of our brain’s processing is done on a subconscious level. [21:11] The subconscious brain is driven by images, impulses, and rules of thumb determined over time. [26:48] The subconscious brain works faster and is really running the show. [29:35] How it’s possible to build messaging if you know how people are going to make decisions. [30:02] Communicating to the subconscious brain and making things simple. [30:51] A little bit about me and why I’m qualified to share this information with you. [31:08] I have an undergraduate degree in marketing and branding. [31:55] Discovering consumer behavior and decision-making when I went to University of Washington. [32:56] I wanted to get a Masters degree in consumer or behavioral psychology. [37:20] How Filene Research Institute helped me find a program in Behavioural Economics. [37:44] The I3 program: ideas, innovation, and implementation. [37:57] I was able to present at the World Credit Union conference and Harvard. [39:18] The moment I discovered behavioral economics. After some research, I discovered this was the program I was looking for. [40:21] I found an online program that offered a Masters degree in behavioral economics at the The Chicago School of Professional Psychology. [41:14] I am now wrapping up my Masters program with some really exciting research In partner with the Filene Research Instituteand a credit union out of Portland. [42:08] This is a six-month study to find ways to get people to increase savings behavior. When the study is over, I will do an episode on it. [42:58] I am a lifelong learner, and I plan on becoming Dr. Melina Palmer. [44:48] The brainy business podcast fills the gap between these academic principles and ways to increase marketing efforts. The focus is understanding the concepts and how to apply them. Thanks for listening. Don’t forget to subscribe on Apple Podcasts or Android. If you like what you’ve heard, please leave a review on iTunes and share what you liked about the show.